I go back and forth between writing tools and methods (rich text, outliners, markdown, mind mapping) and those are all useful but also terrible for procrastination. This made me think back to my first A6 version of StormHack which by strange coincidence was posted exactly a year ago today. The word count is at most 135 words per page, so 8 pages is just over a thousand words — call it a 125 word-per-page target for a nice round number. This is just for one side of A4 paper folded into an 8-page booklet, not counting the other side. 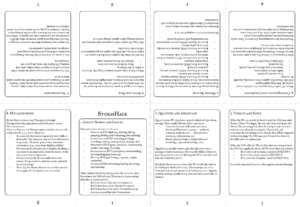 Now although people have risen to the 200 word RPG challenge (hey look, the deadline is tomorrow) I think for me even 1000 words will be a stretch to fit everything in; so instead I need to think about what my little booklet will do. It should be something I can hand out at the table that explains everything people need to know about the system. What about the other side of the page? Maybe a map, setting detail, or a character sheet. But that’s for some other time. 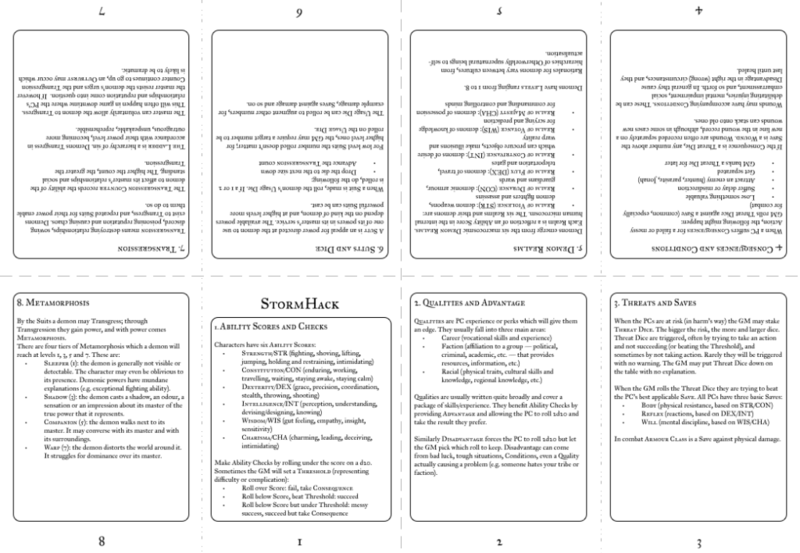 For now, here’s version 2 of A6-StormHack. Print it, cut and fold where it tells you and you’ll have the booklet. I’ve taken a knife to some of the sections in the previous versions; it’s much more mechanic focused. See if it makes sense.